The kids were up past midnight. Something tells me we may regret this decision by mid-afternoon on Sunday. Remember that bag of toys I bought for $1.50 a few weeks ago? Well, it took me about 35 days but I've sold everything in the bag with the exception of one small item which I have no doubt will sell sooner or later. Every summer we try to hit the nearby drive-in theater at least once. Last summer was all sorts of awesome as Amy joined me for an outdoor viewing of The Karate Kid (a.k.a. The best movie ever made). 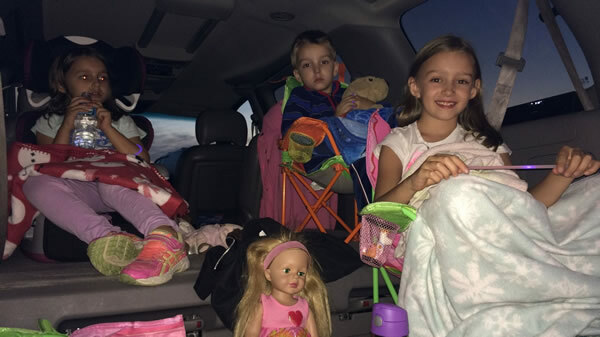 This year we loaded up the kids and headed up the highway on a beautiful Saturday night for the opening weekend of The Secret Life of Pets. Did you catch that? Beautiful Saturday night. Opening weekend. I won't go as far as to say I suffer from any sort of social anxiety but there are two things that can raise my blood pressure in a hurry -- large crowds and traffic. This was the perfect storm. Still, I did my best despite the concession lines that were at least 70-80 people long and the fact that we were three cars downwind from some jackass with a smokey charcoal grill. As expected, the kids loved it which is all that matters. As for me, I distracted myself by piling up some serious points playing solitaire on my phone while I tried to watch the movie between the giant trucks parked in front of us. Charlotte was not our daughter but rather a child that we were permanently caring for until she turned five years old. She was turning five and was being taken back to her real family. Mason had gone missing. Kidnapped? Lost? No one knew. Amy and I were trapped in a grand scheme of massive wooden structures. Some parts were brittle. Other parts were on fire. There were doors all around us but for some reason we didn't leave.